The views and opinions expressed in this article are those of Bruce Hopkins. You should not act on these views or opinions without undertaking your own due diligence as to the voracity and accuracy of his views and opinions. These views and opinions may be wrong or misleading. On Sydney’s Bondi Beach, Bondi Rescue’s Bruce ‘Hoppo’ Hopkins tells The Capital Network’s Lelde Smits about his challenges as a lifeguard, how technology is changing his work and why he’s backing the technology created by Shark Mitigation Systems Limited (ASX: SM8). Lelde Smits: Hello I’m Lelde Smits for The Capital Network and joining me here at Australia’s most famous beach, Bondi Beach, is the star of Bondi Rescue. Bruce ‘Hoppo’ Hopkins – welcome. Bruce ‘Hoppo’ Hopkins: Thanks for coming down. Lelde Smits: Bruce has been a professional lifeguard for 25 years. He’s also the head lifeguard here at Bondi. Bruce, you do so much more than monitor beaches, you’re saving lives. In your role as a professional lifeguard what are the biggest challenges that you come up against? 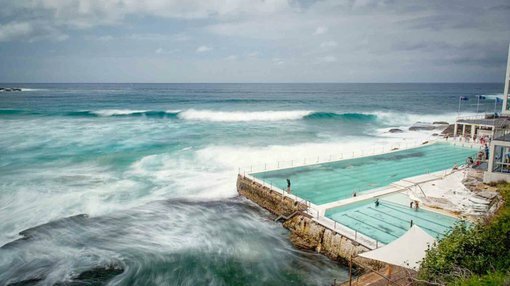 Bruce ‘Hoppo’ Hopkins: We get 30,000 – 40,000 people on a busy day so the rips are predominantly not the best on days down here at Bondi, so we really need to keep a close eye on people going down to the water. We get a lot of tourists that comes down, from all around the world, and obviously aren’t very strong at swimming so we try and teach them to float and if they can float then we can get them out of rips and rescue them. Lelde Smits: For sure, and I imagine the lifeguard game has changed a lot since you first started. Can you take us through what it was like when you started and how it is now? What are those big changes that have occurred in your industry? Bruce ‘Hoppo’ Hopkins: Well when I first started I was handed a whistle and a pair of board shorts and out I went. There was no sun protection, which is in place now, and everything was quite, well not much happening at all. Now it’s moved forward with technology and we’ve got the ipads, we’ve got the laptops, and a lot of technology where we can tell what the swell is doing and the rips, cameras now all along the coastline now, so the technology has really taken over. Lelde Smits: And how has that technology changed your job? Bruce ‘Hoppo’ Hopkins: Well the technology has helped us, we’re minimising our response times to go and rescue people. And, it’s helping us predict what is going to happen in a day’s time or in an hours’ time with the different conditions, the change of tides, and it’s really helping. Marine life come into the bay and it’s really given us a good idea of what’s happening. Lelde Smits: When we speak about challenges, obviously there are sharks in the water and again, part of your job of monitoring beaches is monitoring the sharks. How has technology assisted you with monitoring sharks? And, you have just been appointed the ambassador of Shark Mitigation Systems Limited (ASX:SM8) as well. Can you tell us what that is doing for your job? Bruce ‘Hoppo’ Hopkins: It has really helped the technology, it has given us more to prioritise with people getting caught in rips because now we’re getting alerts if something has come into the bay, comes straight through to the tower here and the guys know whether to launch the jet ski straight away or put the shark alarm on and clear the water and it is something that is really, really helping us perform our job more professionally. Lelde Smits: It has been deployed in Bondi as a trial, how do you see this kind of technology taking off globally? Bruce ‘Hoppo’ Hopkins: I think this technology will go global. It’s something that’s really taken off here at Bondi and is starting to get notice all around the world. And, I’ll probably be travelling with Shark Mitigation Systems Limited (ASX:SM8) around the world as well and showing them how we use this here at Bondi and how effective it is and hopefully it can reduce shark attacks around the world. Note, SM8 is a junior ASX-listed company and investors should seek professional financial advice if considering this stock for their portfolio. Lelde Smits: Now for people that don’t know too much about sharks in general or monitoring them, there are those two sides of the camp – the ones that are more ethical in their approach to monitoring their approach to sharks and the others that aren’t. What do you hear from both sides and where do you stand? Bruce ‘Hoppo’ Hopkins: You hear that some people want to cull the sharks and other people don’t because it will probably stuff the ecosystem up. Growing up as board-rider and surfer down here, it is something that we know – when you’re going into the water you want to get that perfect wave but you also know that sharks live out there, they’ve been out there way longer than we have. So, I don’t think killing off the sharks is going to help. I think we just need to learn to live with them and respect what they do and this technology hopefully will help. Lelde Smits: Absolutely, well thank you so much for sharing that today with us. Bruce ‘Hoppo’ Hopkins: No worries, thanks.